Four countries, eighteen stops, fifty-three days, seven boat trips, two overnight buses, four flights, and an unknown amount number of tuk-tuks, buses, and taxis. The people we’ve met have been Thai, German, Canadian, Laotian, Vietnamese, Cambodian, American, Australian, English, Welsh, Dutch, Irish and Kiwi.The nicest locals we’ve met were from Cambodia. The worst traffic was in Vietnam. The best weather was in Thailand. 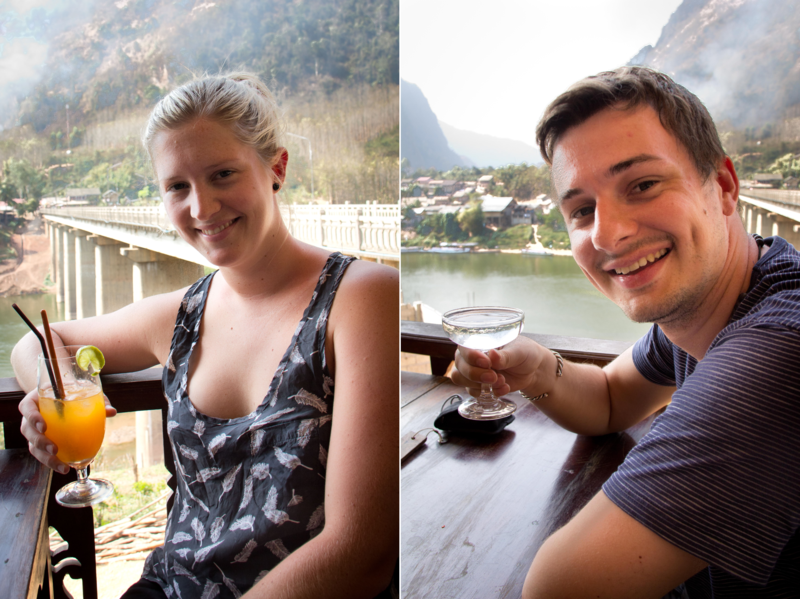 The most secluded spot was in Laos.The most expensive dinner was steak and red wine in Hanoi for my birthday, and the cheapest was actually last night – two serves of rice with chicken or duck and mixed greens with two drinks for only 87 Baht, or $3. The most expensive flight was from Bangkok to Hanoi – because we never used it. The worst boat ride was from Thaton to Chiang Rai. The best was Halong Bay. The most beautiful spot we visited… well that, I can’t decide. Each country has had it’s real highlights and lowlights. When I try to think where my favourite place has been, I come up with no answer. It’s only when I break it down to each country that I can choose spots that I loved more than others. It may be the weather, the people, the food, or the comfort of the bed – each place has had something to define it. In Thailand, Chiang Mai was outstanding. Laid back, plenty to do, with lovely people to meet. The air was clear, the mountains were cool, and the sights were amazing. Our accommodation here was a highlight – Sawasdee Guesthouse, if you’re ever in the area. Down south, Bangkok had fantastic food, ease of transport, but terrible humidity and pollution. The days were hot and long, but you could find great and inexpensive food right outside your front door. Accommodation here was great, too – Udee Bangkok, with clean, cool rooms to escape the hot concrete city outside. Laos was mostly unexplored, but absolutely beautiful. Some of the best indian food you could get was in Nong Khiaw, as well as some of the cheapest beers and accommodation. The people were lovely, if not a little shy of the tourists that have discovered their tiny village amongst the limestone cliffs. In Luang Prabang the streets were filled with people, markets and crepes – Nutella ones, of course! Again the people were lovely and the city was quiet – but the mosquitoes weren’t. Vietnam was surprisingly the most expensive country on the list. We went from Hanoi to Halong Bay, through Hoi An, Mui Ne, Ho Chi Minh City and Phu Quoc Island. Admittedly these are all tourist spots along the coast – but Vietnam is so narrow, there wasn’t much more to visit if you went west! The beef curry pho was delicious, the chicken and cashew nut stirfry fresh, and the rice fields were endless. The people were lovely, as were the sights. Halong Bay, Cham Island, sand dunes in Mui Ne and the Mekong Delta – all beautiful. But Vietnam is where the unlucky turtle literally reared its ugly head and resulted in my phone being stolen, so I’m still a little sour about that! Cambodia. I wish we’d had more time in Cambodia. With only 10 days we managed to see Kep, Rabbit Island, Phnom Penh and Siam Reap, along with countless monkeys, temples and sights. Cambodia has been, as expected, the cheapest country we visited in Asia. Accommodation for as little as $7 a night on an island would be unheard of anywhere else, but on Rabbit Island it was ‘top dollar’. 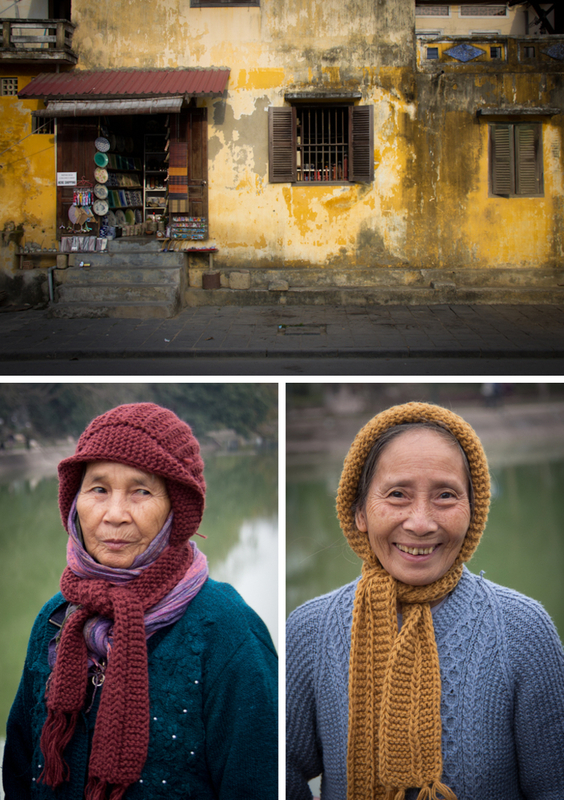 The people in Cambodia were the kindest and most helpful we met. Tuk tuk drivers helped us cross busy roads by blocking traffic for us, and hoteliers recommended full day tours for no commission, and encouraged us to move on to the next city to see more sights, knowing full well that they were losing another nights room fee. Speaking of which, the absolute best hotels we stayed in, in the second half of this Asian leg, were here. Campus Guesthouse in Phnom Penh – speak to Tepy Ban, the abovementioned hotelier. Her brand new hotel is perfect, for only $20 a night. And in Siam Reap, try Motherhome Guesthouse. Five star service, unbeatable for $18 a night. Also n Siam Reap, a man named Long offered to drive me around town while I looked for a store to buy a replacement iPod. We found one after 6 stops, then he waited patiently while I picked up groceries as well. All to be helpful, because they know no other way. Absolutely heart warming. Next up is Jordan. We fly tonight at midnight, arriving in Amman at 0515 local time. Amman is seven hours behind everyone back in Australia, should anyone be interested. We’ll be there for 8 days to see the city, Jerash, Dead Sea and of course Petra. Then onto Egypt for the pyramids, the Nile, and maybe an oasis in the middle of nowhere. 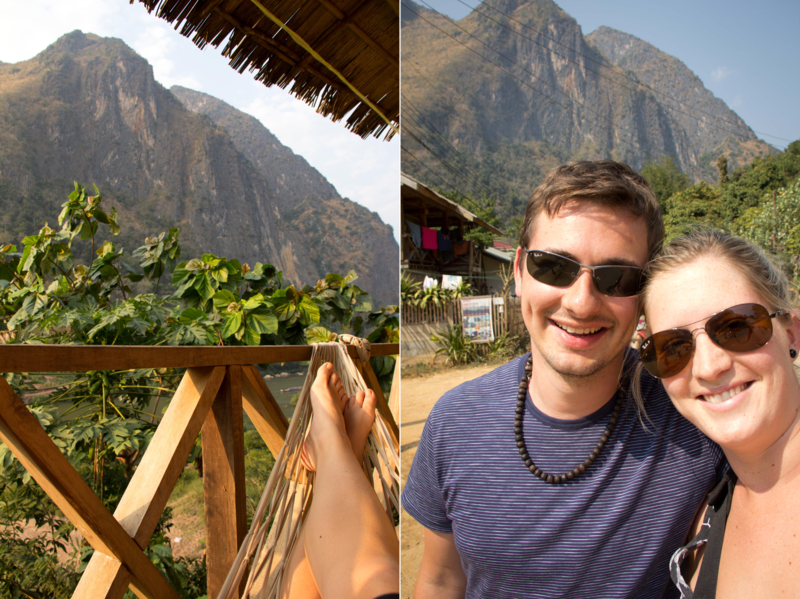 When Jamie suggested we make time in Laos for a tiny village called Nong Khiaw, 140km north of Luang Prabang, I was a little skeptical. The trusty interwebs told him it was remote but beautiful, set amongst huge limestone mountains but without the commodities of everyday living we’re used to. No internet, limited electricity and it would take more than 6 hours to reach by car – I wasn’t so sure. I was even less sure when I checked on Google Maps and the search for Nong Khiaw returned no results, offering the worrying claim that ‘no directions were available for this location’. But I was tired and recovering from the flu, so I put myself and my luggage in Jamie’s trustworthy hands, and when we finally stopped moving and arrived weary, sore and exhausted from the journey here, my eyes lit up. This place is gorgeous. The interwebs (Travelfish, again) have it spot on, I think – this secluded spot in northern Laos would be just a dusty road with a modern bridge, if it weren’t for the two hundred kind and warm locals and the giant limestone cliffs surrounding their homes. It is an absolutely spectacular view, so I’ve attached some photos below, but I assure you that they’ll never do it justice. Nong Khiaw comes very very close to being breathtaking. To make sure we weren’t being ripped off, we promised each other that we wouldn’t take the first accommodation we were offered, and I’m proud to say that we stuck to that. Our third stop, Sunrise Bungalows, was our choice in the end, for a very affordable 100,000 kip per night. By the way, that’s only about $11, and considered ‘mid-range’ for tourists in Nong Khiaw. For that price, we have a double bed with a mosquito net, an ensuite (I use that term loosely, though) and a spectacular view of the mountains. No air con or fan, but we haven’t needed it. It’s warm during the day but cool at night, and we’ve both slept soundly here so far. 12noon Lunch time! A very yummy chicken & vegetable stir-fry and beef & morning glory stir-fry with two soda waters for $5. Huge servings and very delicious. 1pm Traditional Laos massages… we think. The woman in charge made a quick phone call and two smiling teenagers arrived to massage us. And by massage I mean knead, pummel, fold and rock us back and forth for an hour in the name of ‘relaxation.’ Very odd experience but if they meant to put us to sleep, they almost succeeded. 50,000 kip each – $5.50! 3pm Cocktail in a local bar overlooking the river. The seem not to use mixers here so the drinks were very strong, lulling us in to sleep after such an ‘exhausting’ day. 5pm Early dinner while I skype’d my Dad for his birthday. Yes, the town now has internet and it’s free between 5pm-9pm at a small indian restaurant, which also serves very nice and very cheap food. We ate here for a second night in a row because it was really good, and it only cost us 66,000 kip. Rounded up to maybe $8 – bargain! That’s how we spent a day in Nong Khiaw. Although it’s tough to find, and even more difficult to get here, if you’re ever in Laos you should absolutely check it out. * Ps. If we look a little weary in the cocktail photos, it’s because they were taken immediately following the intense Laotian massages. We were pretty knackered! How many people can you fit in a bus? Despite my flu symptoms, we’d made the decision to kick on to Laos today (Friday) and head for the hills – Luang Namtha, specifically. This meant uprooting ourselves from our brief home (or makeshift hospital bed, seeing as I spent the entire time there in my pyjamas trying to get better) in Chiang Rai and heading north-west to Chiang Khong, on the border of Thailand and Laos. We’d read suggestions online to take a more scenic route to Luang Prabang in Laos, rather than the slow or fast boat on the Mekong option, so we embraced the different idea and set forth at 8am from Chiang Rai’s bus terminal. By 10.20am we were in Chiang Khong, and swapping bus seats for a tuk-tuk to travel the last few kilometres to the border crossing on the river. We exchanged some US dollars to Laos Kip (and are now 780,000 Kip richer! But don’t get excited because that’s only $100 worth…) had our passports stamped to exit Thailand and 10 minutes later, we were in Laos. Being an Australian, I found it quite surreal to be standing in one country and looking at another. Very odd. We walked up to the Laos Visa booth and handed over our forms and passports, thinking that we’d had all the luck and missed the early morning queues. But after standing around for 20 minutes, then seeing a bunch of Norwegian hippies hand theirs over for immediate processing, we began to worry that we’d done something wrong. Not know exactly how to express our concern to Laos immigration officers that spoke no english, we resorted to glaring worriedly into their booth in the hope that they’d get around to reviewing our applications before we missed out 1pm bus to our next destination. Fortunately, the man in charge of the Visa stickers finally got around to hand writing our approvals, someone official came in to sign them off, and after paying US$30 (US$35 for Jamie, ha!) we were officially in Laos. A sign detailed the bus timetable to our next stop, Luang Namtha. The owner of the accommodation we’d booked let us know that the bus will take about 3 hours and leaves Bokeo district at 1pm, which gave us 1 hour 15 minutes to find food… cos I was starving! But when we were offered tickets, we were told the bus was departing in 15 minutes, from the bus station 10 minutes away. Figuring this was just a gimmick to get us to buy our tickets quickly without questioning the price, we said yes anyway, and it was the wisest decision we made that day. Speeding down the ‘main street’ (read: ONLY street) in Huay Xai to the bus terminal, we were rushed out of our taxi and on to a waiting mini bus – a standard, 13 seater – where 13 people were already seated and ready to go. But there were no seats… hmm, this is interesting. Not as interesting as the fact that there were another 4 people behind us, waiting to hop on the mini bus as well. Those already seated looked on comfortably, while the rest of us anxiously looked around for a solution, before the makeshift aisle seats were pointed out and we were invited to sit down. So they stacked us in, counted heads, added one more person (a fragile looking old Laos man, who was offered the miniature seat currently used for luggage near the back) and we were away! A quick count revealed that they’d stacked 21 one of us into this mini bus – my back rest was the pile of luggage behind my seat, while Jamie’s ‘aisle’ seat was the size of a pre-schoolers chair. At least there were plenty of bodies to cushion the fall if we crash! The long and dusty road to Luang Namtha took just over 4 hours, with a ‘toilet stop’ half way. No actual toilet, mind you – the driver just ducked into nearby bushes on the busy dirt road and encouraged the rest of us to do the same. Seeing no good hiding spot to go myself, I resolved to hold off on drinking any unnecessary liquids until our final destination, and snacked on my pre-purchased emergency foods – Oreos and potato chips, with tiny sips of water – to keep off my hunger and thirst. Hunger and thirst quenched for the time being, but the headache developed immediately. Dehydration and salty/sugary foods do a headache make! We arrived in Luang Namtha around 4:30pm, exhausted from the dusty, slow, overpacked ride from the border. No accidents though, and it could have been much worse, so we were relieved to make it there and into our accommodation by 5pm for a bath and a rest… and about 2 litres of water for me, asap. Out again an hour or so later to check out the town, and we’d seen everything there was to see just 10 minutes later. There is not much to Luang Namtha, but we did get to drink our first BeerLao tallies at $1.20 each, and eat some yummy beef larb, morning glory and sticky rice for dinner. Just one night here for us, despite my persistent headache (curiously improved while drinking BeerLao and eating dinner, but immediately returning worse than before once we were finished) and tomorrow we take two buses totalling 7 hours to Nong Khiaw, a small village north of Luang Prabang. Here, we’ll rest and recover in riverside bungalows amongst limestone cliffs that are apparently spectacular. Hopefully the headache is gone by then.